As your QnA Maker knowledge base grows large, it becomes difficult to maintain it as a single monolithic set and there is a need to split the knowledge base into smaller logical chunks. While it is straightforward to create multiple knowledge bases in QnA Maker, you will need some logic to route the incoming question to the appropriate knowledge base. You can do this by using LUIS. This article uses Bot Framework v3 SDK. Please see this Bot Framework article, if you are interested in Bot Framework v4 SDK version of this information. 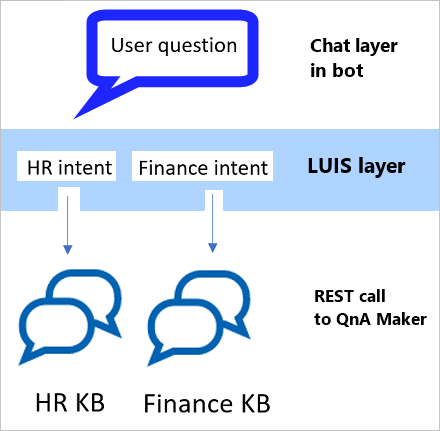 In the above scenario, QnA Maker first gets the intent of the incoming question from a LUIS model, and then use that to route it to the correct QnA Maker knowledge base. Sign in to the LUIS portal. Add an intent for each QnA Maker knowledge base. The example utterances should correspond to questions in the QnA Maker knowledge bases. Train the LUIS app and publish the LUIS app your LUIS App. In the Manage section, make note of your LUIS app ID, LUIS endpoint key, and host region. You will need these values later. Sign in to QnA Maker. Create a knowledge bases for each intent in the LUIS app. Test and publish the knowledge bases. When you publish each KB, make note of the KB ID, host (subdomain before .azurewebsites.net/qnamaker), and the authorization endpoint key. You will need these values later. This article assumes the KBs are all created in the same Azure QnA Maker subscription. Create a Web App bot with the LUIS template. Select the 3.x SDK and the C# programming language. 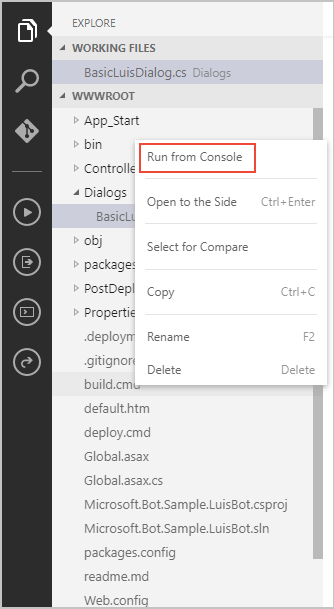 Once the web app bot is created, in the Azure portal, select the web app bot. Select Application Settings in the Web app bot service navigation, then scroll down to Application settings section of available settings. Change the LuisAppId to the value of the LUIS app created in the preceding section then select Save. From the Bot Management section of the web app bot navigation in the Azure portal, select Build. Select Open online code editor. A new browser tab opens with the online editing environment. In the WWWROOT section, select the Dialogs directory, then open BasicLuisDialog.cs. Add the following class to make an HTTP request to the QnA Maker service. Notice that the Authorization header's value includes the word, EndpointKey with a space following the word. The JSON result is deserialized into the preceding classes and the first answer is returned. Modify the BasicLuisDialog class. Each LUIS intent should have a method decorated with LuisIntent. The parameter to the decoration is the actual LUIS intent name. The method name that is decorated should be the LUIS intent name for readability and maintainability but doesn't have to be the same at design or run time. 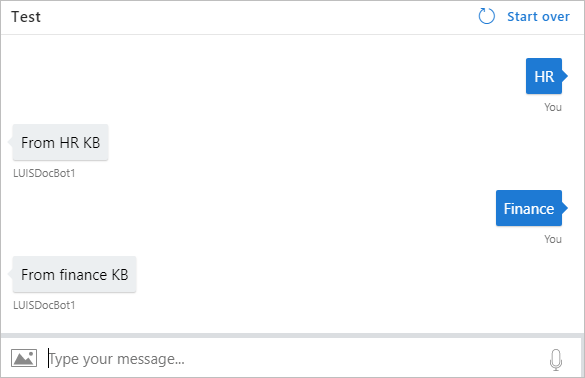 In the Azure portal, select Test in Web Chat to test the bot. Type messages from different intents to get the response from the corresponding knowledge base.